Translators and interpreters celebrate September 30th as their day, since it is the Feast Day of the patron saint of librarians, scripture scholars, students, and of course, translators and interpreters. Eusebius Hieronymus Sophronius, better known today as Saint Jerome, was born sometime between 340 and 347 AD in Stridon, which is located on the Italian side of the modern Italian-Croatian border. He studied theology in Trier, which is one of my favorite German cities. St. Jerome is one of the few people awarded sainthood in recognition of services rendered to the Church rather than for eminent sanctity or miracles. 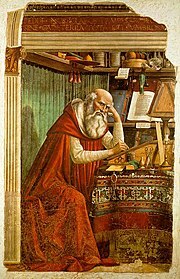 St. Jerome earned his place in history mainly for his translations and revisions of the Bible. He revised translations of the Gospels and the Psalms and translated the Old and New Testaments into Latin. This translation was recognized eleven centuries later by the Council of Trent as the official version of the Bible: the Vulgate. Perhaps his most famous mistranslation put horns on Moses’s head. The original Hebrew scripture (Exodus 34) stated that when Moses descended from Mt. Sinai, he had “rays of light” coming from his head. The Hebrew word can also mean “horns,” and Jerome chose the latter meaning. This error has been perpetuated to the present in many ways. When Michelangelo sculpted a marble Moses in 1515, he relied on Jerome’s description in the Latin Vulgate translation. The resulting 235-cm-high horned statue can be seen in Rome (S. Pietro in Vincoli) today. St. Jerome is usually depicted as a half-clad anchorite, with cross, skull and Bible for the only furniture of his cell, his red hat or some other indication of his rank somewhere in the picture. He is also often depicted with a lion, due to a medieval story in which he removed a thorn from a lion’s paw, and, less often, an owl, the symbol of wisdom and scholarship. Writing materials and the trumpet of final judgment are also part of his iconography. St. Jerome died at Bethlehem from a long illness on September 30, 420. He is buried at St. Mary Major in Rome. * This post was cobbled together from The Translator Interpreter Hall of Fame, Wikipedia, and here. For some fun with St. Jerome, see Sue Ellen Wright and Jost Zetzsche’s Jeromobot videos. We’ve also heard rumors that Jeromobot will be at this year’s ATA conference. I love reading – always have, always will. My family used to make fun of me, because my nose was always stuck in a book – especially on vacation. Reading expanded my vocabulary and put me in the Advanced English classes in high school. My love of books and reading – and research – have made me a better translator, so I was really happy to see today’s Dear Abby column. Most of the translators I know are also big readers, so I’m confident you will all enjoy this. DEAR ABBY: I wrote your mother back in 1985, asking her to encourage my eighth-grade students to establish the wonderful habit of reading. My letter was published in The Portland Oregonian. I still teach eighth-graders, but now I do it in California. It has been 23 years since your mother wrote my students about the importance of reading. Today we have computers, text messaging and cell phones. It’s a different world now, but reading is still important. Would you write a couple of paragraphs about the joys of reading in your column? Your advice will be heeded by my students and many other students in the country who read your column. Kids relate to celebrities, and you are definitely famous. Thank you for your help. — RAY SMYTHE, PALM SPRINGS, CALIF.
DEAR RAY AND DEAR STUDENTS: I’m glad to oblige. For anyone who doesn’t already know, books are magic! Crack open a book and you will be instantly transported into the past, propelled into the future — or if you choose — escape into a world of fantasy. The options are endless. But while history, science fiction, mysteries and romance provide a wealth of diversion, reading provides far more than just an escape. The greatest ideas of our most gifted thinkers lie between the covers of books waiting for you to discover them. And don’t be put off if the books are labeled “classics.” That word means only that they have been enjoyed by every single generation who has read them. Reading is also a vital skill. Perusing a newspaper or doing research online, in addition to expanding your mind, can also be your transport to a successful future. And there is no more effective way to learn to write than by reading. P.S. If this skill does not come easily for you, remember that libraries offer classes in literacy. There is no shame in needing extra help in learning to read, regardless of your age. The only shame is in not admitting it so you can get the help you need. I think one of the most important skills for a translator besides the ability to comprehend the source text and accurately convey it in the target language is organization. Organization can drastically reduce your stress level and keep you on top of things. It is important to keep your workspace, your finances, your schedule, and your computer organized and clutter-free. Dorothee Racette has a fantastic presentation from the 2006 ATA conference on Organizational skills for a successful freelancer business that is an absolute must-read for every translator. There are simple rules for keeping a clutter-free workspace. The most important ones revolve around getting control of your paper. To file effectively and quickly, you need to have the essentials: plenty of file folders, labels, file cabinets or cardboard or plastic boxes, bins, crates or carts. And don’t forget wastebaskets and recycling bins for the items that you choose not to file. 1) Have a system for your active filing. I use four hanging file folders that I file all my important documents in. They are labeled Business expenses, Bills, Bank statements, and Pay stubs for each year. At the end of the year I start four new hanging folders and archive the previous year’s files in an attractive wicker box. Since you need to keep tax-related information for seven years, I shred everything from seven years ago to make room for the new year. Keep indefinitely: annual financial statements, corporate documents (including non-disclosure agreements, minutes of board of directors’ meetings (if you are an LLC or S-Corp), etc. ), and income tax paperwork and payment checks. Keep for 6 years: bank statements, voided checks, purchase records (purchase orders, payment vouchers, vendor invoices), and records (invoices, monthly statements, shipping papers and customers’ purchase orders). Keep for 4 years: personnel and payroll records (if you are an LLC or S-Corp). Keep for 3 years: monthly financial statements. 3) Manage your “to read” pile. You should make a plan to discard the paper as soon as you receive it. If you set it aside to read later, you most likely won’t. I’ve seen suggestions to put these non–urgent “to read” items in large file folder. I use a stacking In, Out, and To Read system. When the folder or bin gets too full, you need to go through it and weed out the items that are no longer relevant or interesting. I don’t let my mail pile up either. I go through it as soon as I receive it and throw all the junk mail in the recycling bin in the hallway. 4) Don’t print it out if you don’t have to. You can’t blame all of your clutter on mail, unfortunately. With so much information at our fingertips as we surf the Web, it can be tempting to print every interesting thing we find. There is no need. It most likely isn’t going anywhere. I know people who print out e-mails (heck, back in 1995 I *was* one of them). There is no reason for this! The only thing I print out now are travel confirmations and invoices. Everything else either gets stored on the computer or can be easily found again using Google. 5) Do you have business cards strewn across your desk or don’t know what to do with the cards when you receive them? I have my business cards filed in a business card folder. I also regularly go through the business card folder and throw out business cards that are outdated. If you have a lot of business cards, consider buying a business card scanner to keep electronic copies of the cards, which can later be searched by name or keyword. 6) Scan the original and throw it out. If you have documents that you need to keep, but you don’t use everyday or don’t have the room to store, use a scanner to create an electronic copy on your hard drive or disk. Also, a shredder is your friend. Run anything confidential or sensitive through a shredder before it hits the recycle bin. 7) Once your office is organized, you’ll want to keep it that way. One web site suggests treating your office as if it were your kitchen. A major part of maintaining order is the way you approach the task. To prevent future paper accumulation, treat the paper in your office as if it’s perishable. Don’t pile it up, telling yourself that you’ll deal with it when you have time. You wouldn’t do that with food in your kitchen. Make decisions on the paper immediately. Keep a recycle bin and a wastebasket next to your desk and use them frequently. Keep filtering, filing, and tossing and you’ll keep enjoying a clutter–free environment. One of my favorite German words is Ohrwurm. An Ohrwurm (literally: earworm) is a portion of a song or other musical material that becomes “stuck” in a person’s head or repeats against one’s will within one’s mind. One of my favorite bloggers shared this little ditty with us the other day, and I cannot get it out of my head for the life of me. She prefaced it as being “the whitest thing [she’d] seen in years.” I apologize in advance for sharing this tune with you because you will not be able to get it out of your head, but it is just too funny to not share. There is some controversy as to whether this clip and this group are actually real. According to some folks, this group really did exist in the 1970s. Even if they didn’t, this is just good stuff! If you enjoyed it, you might also enjoy the commentary here. ABBYY FineReader is very intuitive to use and sometimes even replicates graphics and logos. Users can process documents in 184 languages, including Chinese, Japanese, Thai, Hebrew, Armenian, Cyrillic, Greek, and Latin. ABBYY FineReader also reads pre- and post-reform German orthography, Old German script, scripting languages, and simple chemical formulas. 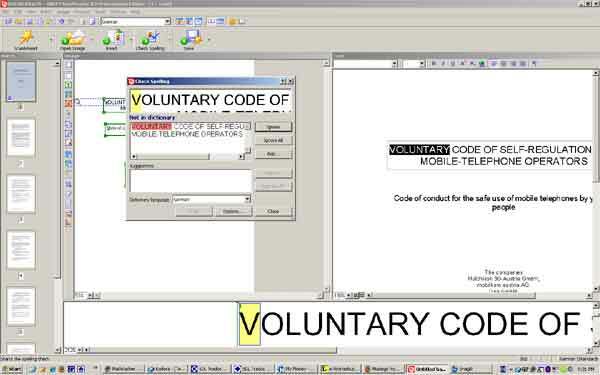 The text recognition software includes dictionaries with spell-checking capabilities for 38 languages allowing verification of recognized text directly in the FineReader Editor. Also, apparently FineReader 9.0 Professional Edition now automatically recognizes the document’s language, which saves you the step of manually selecting the appropriate document recognition language, as well as spreadsheets and tables. PDF Transformer is scaled-down version of ABBYY FineReader. It is also “a comprehensive PDF conversion and creation tool” that “accurately transforms PDF files into editable formats and creates searchable PDF documents from Microsoft Office applications.” PDF Transformer only costs $99.99 and does basically the same thing (PDF conversion and PDF creation). One thing I really like about FineReader is that it does not create as many text boxes as, say, OmniPage. FineReader can convert PDFs as well as graphics (such as TIFs or the eFax attachments I receive) into Word files that can be processed with a translation memory tool. Its Check Spelling feature allows me to ensure that the words were recognized properly, and I can correct them before saving the file. I have also been known to do a “down and dirty” OCR without spellchecking just to get a quick and fairly accurate word count estimate with PractiCount (or AnyCount, Total Assistant or whichever counting tool you prefer). You can also play with the save options to find your ideal settings. I sometimes have to clean up the file by hand, because it has problems with handwritten text and tables (and checkboxes, some bullet lists, etc.). I simply open a clean Word file and copy and paste the text into the new file using the Edit->Paste Special command, which removes all the formatting. I then format the text manually. This also ensures that the margins are consistent and not haphazard, which sometimes happens as well during the conversion. I also find that the program sometimes creates columns when a table would be much more convenient. Again, I simply create the table and then copy and paste the text into it. Some translators I know feel that OCR and formatting should be the job of the agency or project manager and/or they should be paid extra for converting a file into Word. I disagree, but I am willing to accept alternate opinions in the comments below. 🙂 Some smaller agencies aren’t as savvy and don’t know how to use OCR programs. Converting the file also allows me to quickly translate it using my translation memory tool (although one client specifically does not want me to use Trados with its files for confidentiality reasons, which I respect). I also feel I have more control over the actual document I am going to work with if I actually do the conversion myself. I have seen too many files that were sloppily OCRed and not spellchecked, which then makes the text confusing and this could easily lead to a mistranslation. If I do get a file that has been run through an OCR program I always insist on getting the original as well so that I can compare the two files. One very important tip I have is that if you are going to order it, try ordering it from a country other than the United States. I bought my copy off eBay.de. The prices displayed to people accessing the Abbyy website from the States differ drastically from the prices shown to people accessing the website from Europe. ABBYY FineReader 9.0 Professional is displayed to European visitors as costing EUR 139/GBP 89 for the download version, while a price of $399.99 is displayed to someone who lives in the States. I bought my version (FineReader 8.0) for €90 ($116) and received the original CD and a manual in the mail, but you can also order a digital version of the software. Download the 30-day trials of ABBYY FineReader and PDF Transformer to see which one you prefer and shop around for the best price. You’ll find the tools quickly pay for themselves. 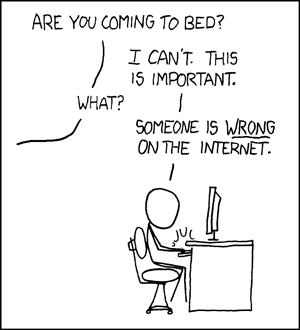 If you knew my friend Susanne, who sent this to me, you would *really* appreciate the humor of this comic strip. As it is, this reminded me of the old newsgroup days, but it can also apply to any translation or non-translation-related listservs you may be on.